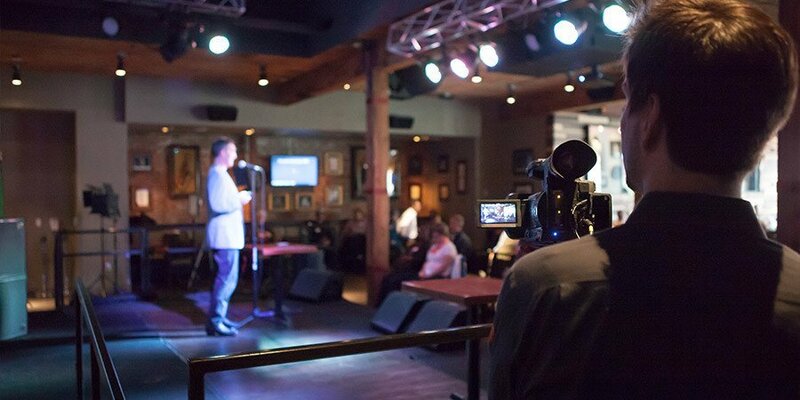 Varvid’s Chicago, Illinois team provides live streaming and webcasting services for events large and small. We can stream directly to YouTube, Twitter, Twitch, Facebook Live, a password protected page, and many other platforms. For smaller projects (Basic or Standard), our videos look very similar to a Ted Talk or a moderator led panel discussion. Our larger projects (Premium) are a great option for clients that want a higher production value. Have a big budget project in mind? Check out our Large Custom Projects page. See below for sample videos and sample pricing. Click the “Get a Quote” button to provide us with details for your event and we’ll get you a proposal within a few hours or schedule a follow up call if we require more information. Starting at $3,999 for one day per room. A Basic Live Stream is ideal for single person presentations or small panel discussions where audience reaction shots are not important. Starting at $6,499 for one day per room. A Standard Live Stream is our most common package and is good for covering larger panel discussions, musical or dramatic performances, or if you want to include shots of the audience into the broadcast. Starting at $9,999 for one day per room. A Premium Live Stream is great for medium to large sized events that want high production value. For projects bigger than a Premium, check out our Large Custom Projects page. Q: Can you integrate social media with the live stream or webcast? A: We can easily integrate Twitter and Facebook feeds with your broadcast and we can add a public chat feature as well. Check our Connected Event Services for details. Q: Can you manage a pre-event registration process? A: We can create a custom pre-registration process that can include pre-payment for content, email collector required for access, and a password protected video player. Q: Can you integrate pre-recorded videos into the stream or webcast? A: Yes, we can integrate pre-recorded video content into your stream or webcast. Q: Is the viewing experience mobile and tablet friendly? A: Yes, all of our content is optimized for delivery on mobile and tablet devices. Q: How long does it take you to deliver or upload final video files after the webcast or stream is finished? A: Our team can deliver or upload a web friendly version of your webcast or stream in less than ten minutes. Q: Can you create short “highlight” videos for YouTube and Social Media? A: Yes, we can provide an editor onsite to edit your content and deliver short videos within an hour after your stream or webcast. Q: Do you have a process for testing the stream before the event? A: Yes, we have multiple stages of testing that we follow before each stream or webcast. Two weeks before the event we require an onsite internet speed test, and one or two days before the event we test a stream with our entire setup, and we do a full test with the onsite AV test the day before (or morning of, depending on schedule) the event. Q: What is your support model, what hours are you available? A: In the days leading up to the event you will have the cell number of the project manager and will be able to contact them between 9am-9pm. The on-site Varvid team will be available for support 24/7 during the event. Q: Do you have a backup plan or failover system for the stream? A: Internet and streaming back up solutions are provided onsite. More complex redundancy solutions are included as options in all project proposals. Internet failover is automatic, and our CDN (content delivery network) software will deploy back up immediately if a problem arises. Q: What kind of analytics can you provide? A: We always provide metrics on unique visitors, total hits, average viewing session, and geographic data. Depending on the CDN (content delivery network) we can provide different kinds of metrics and analytics. If you have a specific need we can pair your project with the proper CDN to help you achieve your goals. There’s no post-production required for any of our projects and we will deliver a web-friendly video file within minutes after the webcast is finished.